An essential part of equipment safety is the fail-safe position to be maintained when a fire breaks out. In case of pneumatic linear actuators, the fail-safe position must be assumed and maintained when air supply fails or the diaphragm ruptures. Usually, springs are used to perform this task. They force the valve to move to the fail-safe position when dangerous situations or damages occur. The springs act against the pressure of the process medium to move the valve to the fail-safe position upon failure of air supply, and keep it in this position. When a fire breaks out, the fail-safe position of the pneumatic actuator will be negatively affected. The high temperatures cause the springs to lose their force. With time passing by and temperatures rising, the springs can no longer keep the valve in its fail-safe position. In case of fail-safe action 'fail-close', increasing leakage cannot be avoided. Figure 1 shows how a preloaded spring loses its force under the influence of temperature. Shortly after the fire has broken out, the spring force decreases considerably. As a result, the ability to keep the valve in fail-safe position during the fire will be lost within a short period. The loss of rigidity and the considerable decrease of force are caused by a re-crystallisation process within the material structure of the spring. The use of conventional fire protection systems, such as coatings, does not provide decisive advantages since springs are moving components and subject to dynamic stress. Coatings cannot sufficiently retard the loss of force either. A little more than a decade ago the problems discussed above were solved with the development of a thermostatic cartridge system. This passive system was supposed to recognise non-typical temperature rises and respond to them actively. This cartridge consists of two cylinders sliding freely within each other. It is filled with intumescent material that can be composed in such a way to determine the release temperature within certain boundaries and, of course, the increase in force it exerts. The increase in volume causes the cylinders to move in opposing directions. During this process, considerable forces are developed. The operating direction of the cylinders corresponds to that of the springs, thus opposing their gradual loss in strength. Installed in actuators with safety equipment, these patented cartridges ensure decreasing spring force compensation. The safety cartridge is heated according to the unit-temperature curve in which the development of temperature over time is plotted in accordance with DIN 4102, Part 86. The design of this irreversibly operating cartridge is simple and allows retrofitting of already installed pneumatic actuators. 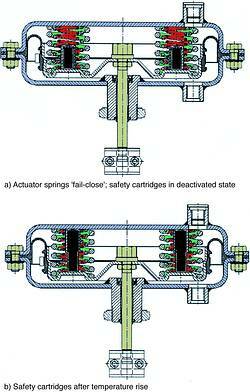 A safety cartridge is installed within each actuator. The mounting position of the pneumatic actuator does not affect the cartridge installation, and the cartridges will always perform their task of closing the valve in the event of a fire. The selected overall length of the cartridge does not affect the travel or operating range of the springs at normal operating temperatures. Only in the event of a fire does the cartridge become effective, reacting to the unusually high temperatures. A control valve equipped with such a safety cartridge was subjected to a simulated fire. The test aimed at maintaining the tightness of the valve over 30 minutes minimum with constant system pressure acting on the valve. The time span is based on the specifications given in BSI 6755/27. The test valve described was heated in a test room according to the unit-temperature curve. The pneumatic actuator was equipped with six cartridges installed within the actuator spring assemblies. The valve contained water. During the heating phase, steam was produced. A pressure regulator installed outside the test room maintained a constant system pressure of 3 MPa (30 bar). Prior to starting the test, a pump had been used to produce this pressure. Downstream of the seat/plug restriction area, the valve was open to atmosphere. The temperature in the test room and the pneumatic actuator was measured via thermocouples. The temperature increase over time in the test room and in the pneumatic actuator was correspondent to the unit-temperature curve (Figure 1). The system pressure of 3 MPa in the valve upstream of the seat remained constant during the entire test procedure. As was expected, the rubber diaphragm was completely destroyed at the end of the test. With the exception of the springs, none of the metallic components showed any visible damages or deformations. The task, to provide tight shut-off against the pressure of 30 bar prevailing throughout the test and during the high temperatures of the fire, could be fulfilled over the entire period of temperature supply. Apart from the safety cartridges, there are additional solutions that can be integrated in the pneumatic actuator for safety. It is possible to use a preloaded spring assembly released at an adjustable temperature to oppose the standard fail-safe position. This patented method includes preloaded spring discs, which act in opposition to the standard actuator springs. The spring discs are bound by a solder strip and the type of solder determines the temperature at which the spring discs are released, acting as an additional safety device. Upon release of the spring discs, the standard fail-safe action is reversed. The solder joint is stable under normal operating conditions, such as permanently elevated ambient temperatures. A pneumatic actuator equipped with such a safety device is presented in the sectional drawing (Figure 4). The safety equipment shows a simple structure, enabling the pneumatic control valve to assume fail-safe position or reverse this fail-safe position upon outbreak of fire. This relatively recent advance has meant that pneumatic control valves could be used in fields of application never considered possible before. Compared to pneumatic control valves with standard fail-safe action, actuators equipped with these innovative safety devices are able to maintain the fail-safe position over an extended period of time when exposed to fire. The safety cartridge filled with intumescent material plays an essential role in this safety technique. Thanks to these cartridges, the valve trim remains effective even at the extremely high temperatures of a fire, thus preventing leakage of hazardous media. The cartridges compensate for the loss in force of the springs, which under less extreme conditions guarantee fail-safe action. Another asset of the safety equipment is its cost-effectiveness compared to other safety equipment in use. Since the safety cartridges can replace more complex and hence expensive safety devices, they will prove to be another remedy against the pressure on costs. Alternatively, conventional fail-safe action can be reversed when a fire breaks out. Releasing preloaded and bound spring discs reverses the direction of standard fail-safe action of pneumatic actuators. An important aspect in this innovative method is the fact that the temperature range in which the springs are released can be adjusted as needed. In view of all the advantages of the modern safety equipment by Samson, the use of pneumatic control valves could now be taken into consideration even where sensitive applications are concerned.